Operation Olympic was to be proceded by a deception plan intended to draw away as many Japanese forces as possible. This deception plan was known as "Operation Pastel", and the idea was to convince the Japanese that no direct invasion was planned, and instead the allies were going to size Chinese ports with a view to a blockade/siege strategy. 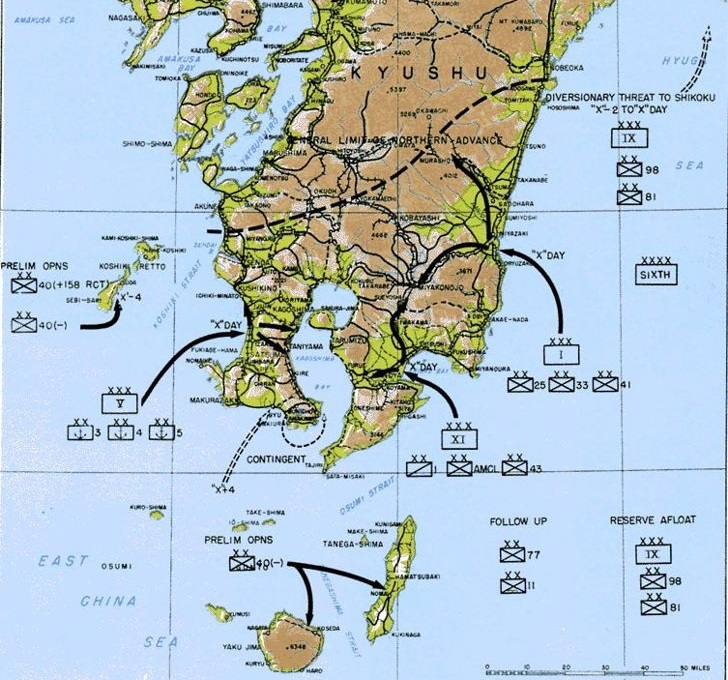 The next step in the invasion would be the seizure of three Japanese offshore islands (Koshikijima, Tanegashima, and Yakushima), begin five days before the main invasion. The purpose of this was so that these islands would be available as secure anchorages for ships that were either not being used during landings or were damaged by air attack. The invasion proper would then begin on November 1st, "X-Day". A total of fourteen US divisions of the the US Sixth Army would take part in the initial landings, with a corps landing at each of three points (Ariake, Kushikino and Miyazaki) using a total of 35 landing beaches, each of which was codenamed after a particular type of automobile. The ultimate objective in Operation Olympic was not to capture the whole of Kyushu, but rather to capture the southern third of the island. This would be then be used as a base (and airbase) for the follow-up, Operation Coronet.